This is the first of a proposed series of pieces on population health and patient Impactibility models — defined broadly as a way of understanding which groups of patients will be the most amenable to specific health and care interventions — and the resulting implications for managers and clinicians. Those patients at the very highest risk may be hard to support successfully; it is therefore important to look lower down the risk pyramid when considering preventive interventions. The group of patients identified by the predictive model may be quite heterogeneous, and they may require different interventions which may have widely varying impact. Most predictive risk models rely heavily — and for understandable reasons — on an individual’s clinical record, and rarely take into account other personal, social and environmental barriers to effective preventive care. None of this suggests that predictive algorithms are not an important tool for use as part of health improvement programmes, rather that there are more effective ways in which they can be used. For example, it is frequently suggested that it is more effective to use risk models to stratify patients within a cohort identified through other means, such as by considering multimorbidity or prior utilisation. This is a helpful approach when considering predictive models related to risk of emergency hospitalisation, although it is perhaps less appropriate when using risk models predicting other events, such as which patients are likely to acquire a specific long-term condition, or individuals who will be shortly entering the last phase of their lives (mortality risk models). In both of those cases it is reasonable for the patient cohort to be identified by the risk algorithm. In other words, it is important to take into account exactly what it is that is being predicted. Impactibility models may refine the output of predictive models by (1) giving priority to patients with diseases that are particularly amenable to preventive care; (2) excluding patients who are least likely to respond to preventive care; or (3) identifying the form of preventive care best matched to each patient’s characteristics. A common example of patients in group (1), and one he also discusses, are those patients with long-term conditions which have been shown to respond well to appropriate primary care or outpatient treatment — the chronic Ambulatory Care-Sensitive Conditions (ACSCs) — such as asthma, COPD and congestive heart failure. More broadly, focusing on patients with other gaps in care, and improving the coordination of their care, can help prevent hospital admissions. Lower priority for patients with attributes suggestive of likely noncompliance. These characteristics were said to include mental health diagnoses (schizophrenia, depression, dementia, or learning difficulties), addictions (smoking, alcohol misuse, or illicit drug addiction), and social factors (language barrier, housing problems, or being a single parent). 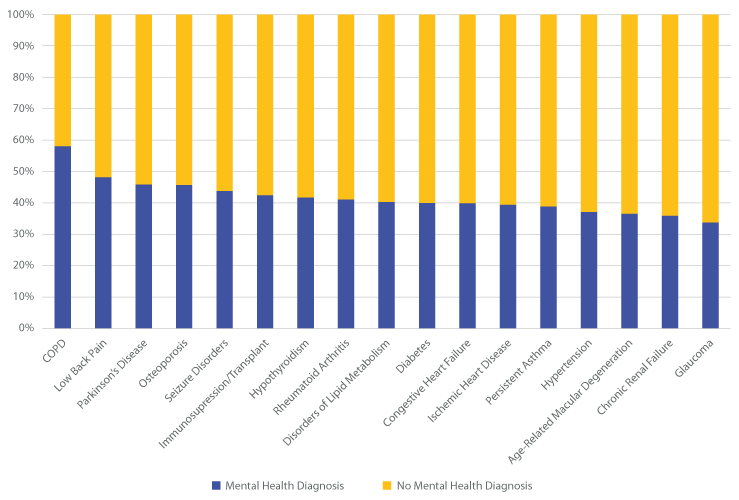 As can be seen, across the whole STP footprint, nearly 60% of all patients with a diagnosis of COPD also had a diagnosis of one or more mental health conditions — and two other chronic ACSCs, Congestive Heart Failure and Asthma, are also found frequently alongside mental health conditions. Further, these figures show the average across the whole STP area; there will doubtless be localities where the incidence of mental health conditions with these chronic ACSCs is much higher. Even from this simple analysis, it can be seen that de-prioritising some preventive programmes for patients with mental health conditions may well mean that large numbers of patients with chronic ACSCs might not be offered support or interventions that could reduce the need for urgent care services. Therefore taking that approach, as well as being ethically questionable, and clearly running counter to the first principal of the NHS Constitution, could also significantly reduce the effectiveness of chronic ACSC management programmes. Impactibility considerations at their most simple are thus describable in terms of improving the targeting of care interventions on those individuals who will most benefit from them. But as Lewis notes, in so doing they may significantly reduce the overall impact of the prevention programme taken as a whole. Rather, we argue, understanding the pattern of illness in this way enables better prevention programmes to be defined in the first place. There seems a strong argument that to improve the impactibility of interventions addressing these chronic ACSCs, any such programme must also include an additional focus on mental health support services. This could be seen as option (3) in Lewis’ paper — identifying the form of preventive care best matched to each patient’s characteristics. Further, from analyses carried out in a number of areas it is very apparent that certain clusters of conditions are often correlated with areas of higher deprivation. Work during 2017 in a South London borough also identified that such clusters often occur in areas where the use of urgent care services is significantly higher than expected from consideration of healthcare records alone. In other words, while the group of patients without other social factors or mental health conditions may be relatively straightforward to support effectively with prevention programmes — that is, they are individually more impactible — the net benefit from such a programme, in terms of reduced pressure on local A&E services, may actually be less than expected. So alongside questions of impactibility should be an equivalent consideration of the benefits which arise should the prevention programme be successful. This text has attempted a reading of Lewis’ 2010 paper in the context of our own analytical findings in local care communities. Implicit in this has been a recognition that his work is based upon the findings from semi-structured interviews, and can thus be readily enhanced by considering actual numerical data. Further, as the evidence was drawn from US contexts, work may be needed to convert some of the approaches to impactibility modelling that he describes for use in the somewhat different UK health and care economy. Nevertheless, it remains one of the most useful and wide-ranging analyses of impactibility currently available. Sollis has conducted population health analytics across a large number of geographies, including Sustainability and Transformation Partnerships (STPs), CCGs and Primary Care Homes (PCHs). See our STP Population Health Overview, for example.